Well 2014 is coming to an end and it is time to reflect on everything God has done during this past year. We are so privileged to a part of God’s plan for reaching Costa Rica and the lost and poor around the world. This year has been full of breakthroughs for us as a base. These breakthroughs will help us have a greater impact in the different áreas we work with and will also open up new opportunities. We would like to thank all the wonderful volunteers and mission builders that have come down over the year to help. They have come from Switzerland, Sweden, Finland, Canada, South Africa and the US. We are not a big team so having these willing volunteers has really made our job a lot easier. We hate to see them go but hope they will come back again. donated items from Portland Oregon. Well this past Friday the shipment arrived and we are in the process of unloading it. 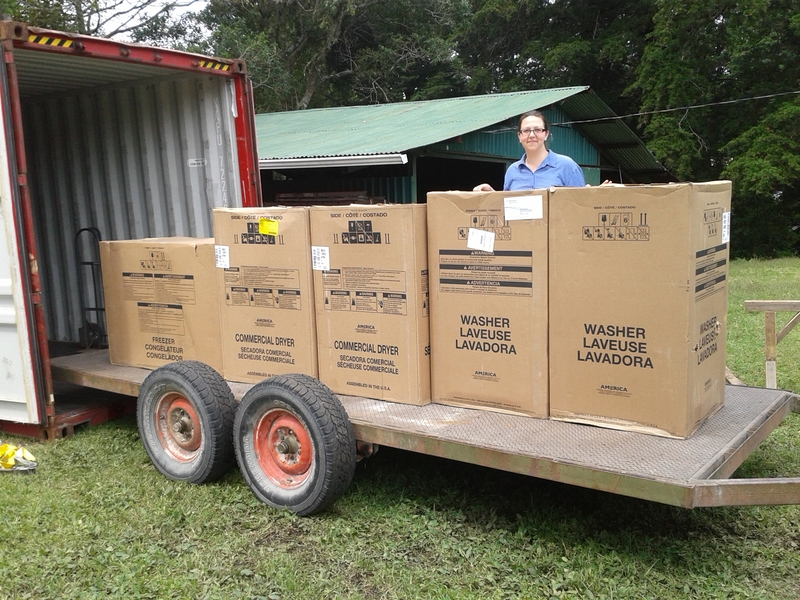 Some of the items in the container are two commercial washers and two dryers, a new freezer, tools, ladders, and a flatbed trailer. 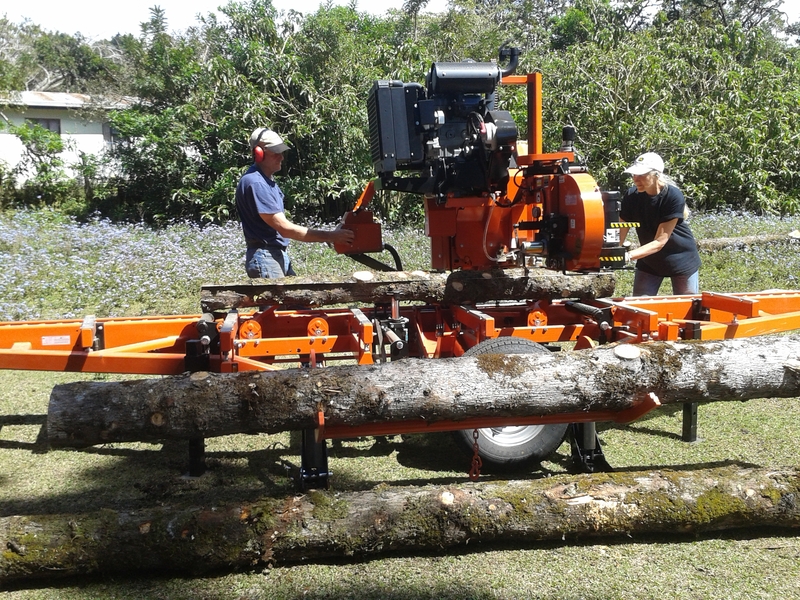 But most importantly we were given a portable Woodmizer sawmill which we can use to mill our own lumber. This a $40,000 piece of equipment which is portable so we can take it to the different locations where we are doing building projects. With the arrival of this sawmill we are going to begin building Homes of Hope. This is a YWAM ministry which builds homes for families at risk. The only thing we are missing is a truck to pull the sawmill and trailer. We have found a truck to buy but we need $20,000 to buy it. If you are interested in helping meet this need please contact us and let us know. We really need to do this before the end of the year so if you are thinking of some year- end giving opportunity this may be it. Thanks for considering this request. The other bit of news is that the container also brought us all the hardware and cables for our ropes course. A team from Ropes International will be coming to our base in Mid February to help us build it. We have been praying for this to become a reality for over three years to it is great to see it finally coming to pass. By the end of February our ropes course will be open for business so send us your teams and churches to come participate. This a great tool for building teams and developing leadership. It is also a good way to teach your team to problem solve as a team. In January we will be having our fourth Rodeo Bible Camp. We are expecting 30-40 kids so please be praying for this evangelistic effort. A cowboy church from Colorado will be coming down to help us run the camp. We will have barrels, poles, roping, goat tying and bull riding. Every time we have these camps kids give their lives to Christ so we covet your prayers. Our School of Environment and Resource Stewardship begins in January. It looks like we will have the largest school we have ever had so we are excited about that. This year we will be offering four weeks of seminars during the EARS school for those who want to get the training but can’t afford to do the whole 12 week school. The topics we will offer are Sustainable agriculture, Water Technologies, Aquaponics, and Appropriate Technologies. For more information just check out our website. Well we thank all of you for your love, prayers and financial support. We consider you all as our partners in the ministry. Without all of you it would not be possible. Please come and visit this year. We would love to show you what God is doing at YWAM Heredia.